Sarsfield, Ontario is a village in the east portion of the City of Ottawa in the former township of Cumberland. The first residents of the village now known as Sarsfield were mostly French-Canadians from Lower Canada. In 1854, families began to establish in the area: Potvin, St-Denis, D’Aoust, Lafrance and the Éthier. One of these colonizers, Sévère D’Aoust, bought land from the Crown and later gave part of this land for the construction of a Roman Catholic church, completed in 1886; this had such an impact on the village that it was known as Daoust’s Corner. The region was also known as Bear Brook. The village was renamed Sarsfield in 1874 when an Irishman, Michael O’Meara, opened a post office and gave it the name of an Irish hero, Patrick Sarsfield. 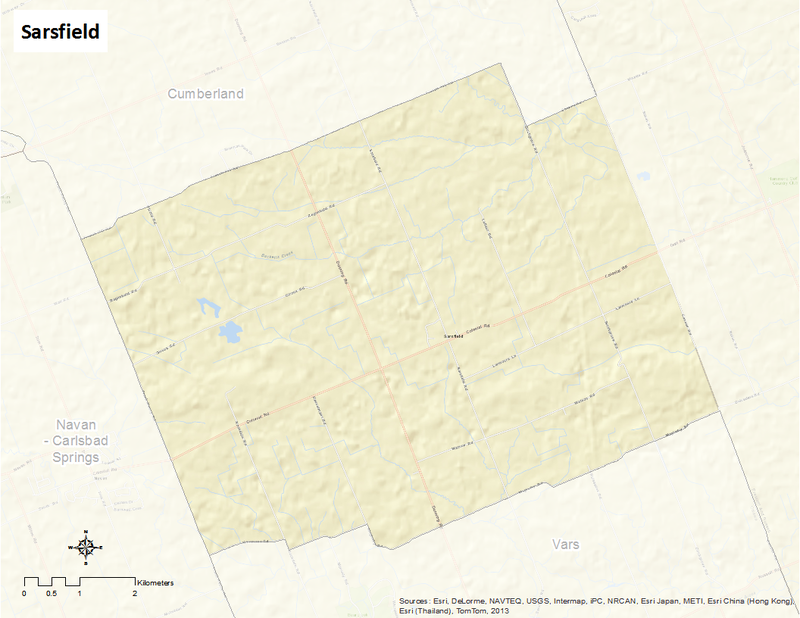 In 2001, the Township of Cumberland was amalgamated to the City of Ottawa.